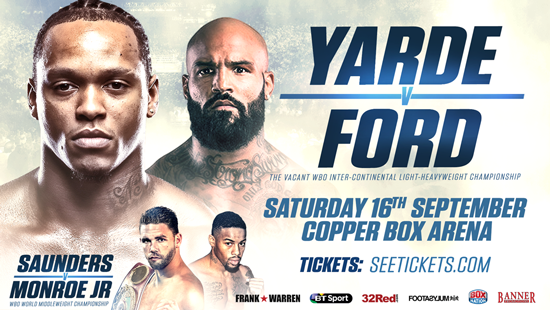 Dynamite punching Light-Heavyweight talent Anthony Yarde will face undefeated Canadian Ryan Ford for the Vacant WBO Inter-Continental strap at London’s Copper Box Arena on September 16th, live on BT Sport and BoxNation. The match-up doubles up as an Official Final Eliminator for the Commonwealth Title as powerhouse Yarde aims to make it three belts in three fights at the East End venue. Undefeated Yarde (12-0, 11 KO’s) claimed the Southern Arena title by defeating Chris Hobbs in May and added the WBO European strap in July with a first round demolition of Hungarian Richard Baranyi, along with a number eight spot in the organisation’s World rankings. Ryan ‘The Real Deal’ Ford is unbeaten in 12 fights, with seven of his wins coming inside the distance. The Edmonton resident is determined to inflict a first career defeat on rising star Yarde. “I want to test myself and keep moving on to new levels,” said Yarde. “It doesn’t make any sense to take a step back when I can keep moving towards my ultimate goal – a crack at winning a World Title. “Frank Buglioni knocked out Hosea Burton – why would I want to fight him? I already have a higher World ranking than both of them and I’m a European Champion. When I come through this fight I’ll have a shot at yet another belt. “I’d have to wait until next Summer to face the British Champion and I’ll be way beyond that level by then. Both Burton and Buglioni have been knocked out so they are hardly a stick to be measured with. “I made Buglioni a huge offer, more money than he’s ever earned to fight Anthony, but they didn’t want to know. The best should want to fight the best but I’m not going to waste Anthony’s time going down that route. “Anthony guarantees entertainment in every fight. His hand-speed is brilliant and the way he picks his shots, he picks them so well. When you think he’s only had 24 fights in his whole career. Half amateur, half professional. That’s a statement for a young guy to be where he’s at. WBO Middleweight World Champion Billy Joe Saunders makes the second defence of his crown against Willie Monroe Jr in the evening’s main event; teenage Heavyweight sensation Daniel Dubois takes on AJ Carter for the Vacant Southern Area strap in only his fifth contest; knockout artist Joe Pigford takes on Kieran Smith for the Vacant WBO European Super-Welterweight title; supported by an action-packed undercard featuring the very best up-and-coming Southern talent.